Lecture (in English) by Professor Gilles Kepel, a leading French scholar on the Middle East. On 17 September 2010, in the central Tunisian town of Sidi Bouzid, street vendor Mohamed Bouazizi set himself on fire and kindled the Arab world. The long-standing rules of Ben Ali, Mubarak, Gaddafi and Ali Saleh collapsed, while military repression saved the Bahreini and Syrian regimes for the moment. In two years, the revolutions have toppled dictatorships, but they have also frequently brought the Muslim Brotherhood to power. Salafism has proliferated in a context of growing poverty, and al-Qaida, whose imminent demise was hastily announced in the aftermath of the revolutions, now arises again from Syria to Mali. Whatever happened to the Arab Spring’s ideals of freedom, democracy, and social justice? What is the role of Gulf monarchies in the ascent to power of Islamist parties? Why is the Sunni-Shia conflict increasingly diverting revolutionary energies, while Syria descends into atrocious suffering? 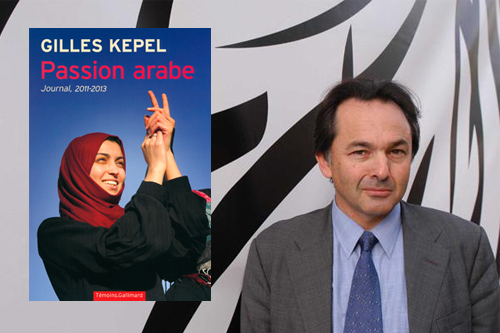 Building upon four decades of expertise on the Arab world, Gilles Kepel went back everywhere (Palestine, Israel, Egypt, Tunisia, Libya, Oman, Yemen, Qatar, Bahrain, Saudi Arabia, Lebanon, Turkey and Syria) and met with everyone (Salafis and secularists, Muslim Brothers and military officers, Jihadis and intellectuals, ministers and peasants, unemployed graduates and oil rentiers). The product of this journey is a diary which Kepel first wrote from day to day, then enriched once back in his study. In Arab Passion, the author infuses his own passion for the region into a fascinating account of the travails of societies advancing on their ways of sorrows, and hopes.